Main Office Normal Working Hours 8 a.m. - 4:30 p.m. 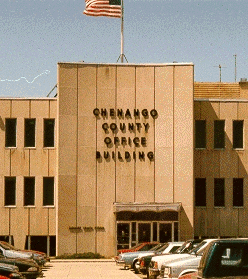 There are three solid waste and recycling facilities operated by the Chenango County Department of Public Works. The Pharsalia Landfill located in the Town of Pharsalia. Two Transfer Stations, one in the Town of North Norwich and the other near the hamlet of Brisben. Pharsalia (M-F) 8:00 a.m.-4:00 p.m., (Sat.) 8:00 a.m.-12:00 p.m.
Educational programs on recycling as well as tours of the Landfill and the recycling facilities are available by contacting Dustin Hendricks, Waste Management Program Assistant, by phone at 337-1792 or via email: dhendricks@co.chenango.ny.us.